The gospel contains several warnings against placing our security in self-sufficiency. Such a security leads to eternal death for it prevents one from relying on Jesus Christ and on his gifts of the forgiveness of sins and eternal life. The rich man is not called “fool” because he was rich, but because he placed his security in his material possessions. 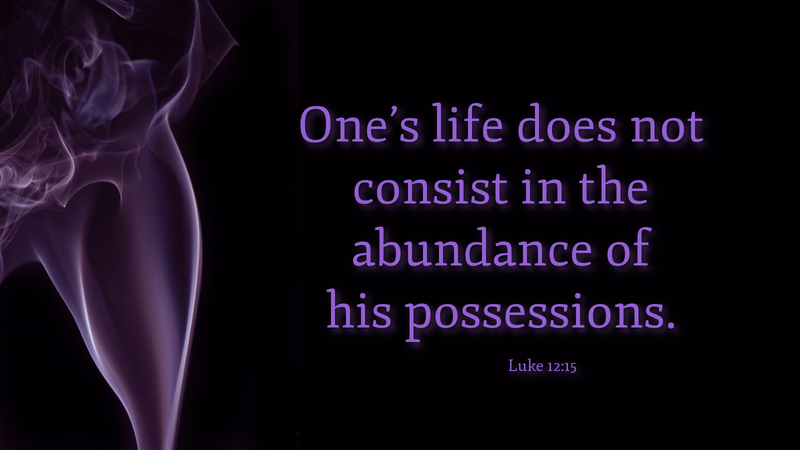 In several other passages of the Scripture, we are warned against placing our security in material possessions. The rich man’s material abundance led him to corrupt his soul by relying on his wealth. Because he placed his security in his wealth, he made no provisions to help the needy with his material possessions. Stories of people like the rich fool man are many. It is sometimes puzzling to find in poverty-stricken nations of the world, a handful of individuals who own the wealth that would make a big difference in alleviating suffering if it were to be put to the service of the nation. The danger to place one’s security in material possessions hunts even those who are not materially rich. Whether rich or poor, anyone who places his security in something other than God, resembles the rich fool man. Prayer: Father God, in your love for me, free me from the power of the things of this world so that I may fully rely on you and your gift of salvation through your Son, my Lord Jesus Christ. Amen.